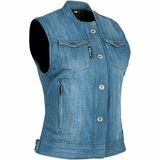 Mindi - MotoSport Portland, OR Cute Vest, great for layering "This is a cute vest, will be great for layering come this fall. A hoodie would look great under it in my opinion - or a flannel shirt. Its got a front zip with snap closure - the snaps look like buttons. On the inside left there is an elastic conceal carry spot - so a small revolver or pistol might be ok there but nothing too heavy or large if you're planning on conceal carry use. It doesn't have any internal pockets but there are two front outside pockets that have a zip closure as well. There is a zip open spot in the back for the 'Vault Spine protector'. Its fairly thin so doesn't feel too bulky when wearing. You could remove it and use the vest without if you chose to. Sizing! I feel it is true to size, I wear an XL in most vests and shirts. I ordered the XL in this vest and there is PLENTY of room in the chest and arm openings - more so than I expected as the chest is usually where things are too tight for me. I wear a 14 pants and the XL zips/buttons at the waist with no issue as well."